Speaking to reporters on a return flight from Bosnia on Sunday, Erdogan said the 57-member Organisation of Islamic Cooperation (OIC) had recommended that a boycott be imposed on Israeli goods. “I hope that OIC member countries implement a boycott decision in line with the recommendation. Consequently, no product should be brought from there any more. Naturally we will assess this situation in the same way,” Hurriyet newspaper reported Erdogan as saying. A declaration by the OIC on Friday repeated a call for countries to ban “products of the illegal Israeli settlements from entering their markets”, referring to goods produced in the Israeli-occupied West Bank and Golan Heights. The declaration also called for “economic restrictions (on) countries, officials, parliaments, companies or individuals” who followed the United States and moved their embassies to Jerusalem. U.S. President Donald Trump’s move to recognize Jerusalem as Israel’s capital and shift the U.S. embassy there reversed decades of U.S. policy, upsetting the Arab world and Western allies. 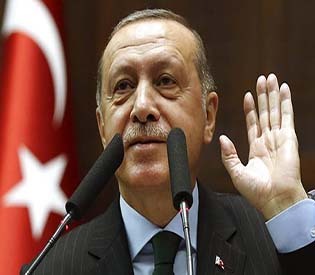 Erdogan said last week that Trump’s move had emboldened Israel to put down the protests at the border with Gaza with excessive force, likening the actions of Israeli forces to Nazi Germany’s treatment of Jews in World War Two, when millions were killed in concentration camps. The violence in Gaza, where more than 60 Palestinians were killed on May 14 led to Turkey and Israel expelling each other’s senior diplomats. Erdogan also traded barbs on Twitter with Israeli Prime Minister Benjamin Netanyahu.